The recent hiring of Rick O’Donnell as a special adviser to the board of regents at the University of Texas System has some observers — worried about the implications for the University of Texas at Austin — playing connect the dots. The recent hiring of Rick O’Donnell, a higher education reform advocate with a healthy doubt of the value of academic research, as a special adviser to the board of regents at the University of Texas System has some observers — worried about the implications for the University of Texas at Austin — playing connect the dots. The leadership of the Association of American Universities, the country’s most elite collection of research universities, has already expressed discomfort with reforms being implemented at the Texas A&M University System. Senate Higher Education Chairwoman Judith Zaffirini, D-Laredo, worries that “if they tie this into the governor through Jeff Sandefer and through the appointments of these most recent UT regents,” the AAU could see something more than simply a convergence of like-minded thinkers. They might draw the conclusion that a coordinated statewide effort is afoot. The Jeff Sandefer in question is a successful Austin businessman, a friend and donor to Gov. 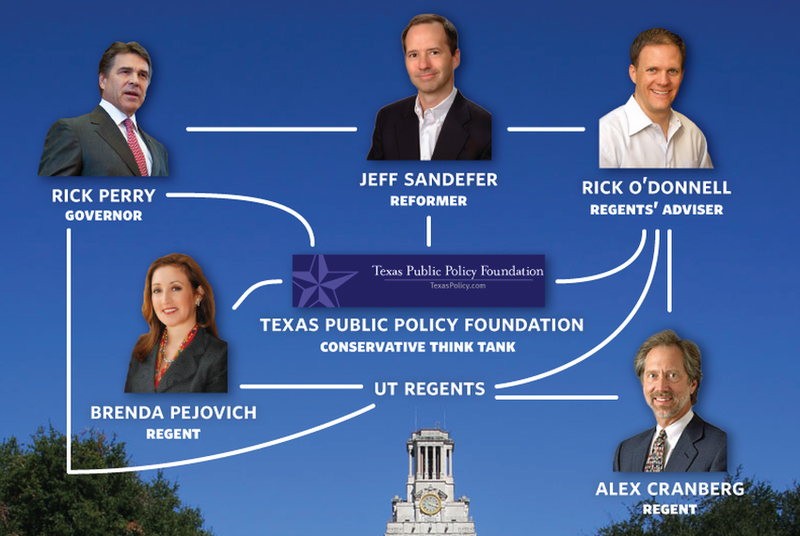 Rick Perry, and a board member at an influential Austin-based conservative think tank known as the Texas Public Policy Foundation — the source of many of the reforms being implemented at A&M that have set the old academic guard off kilter. Many of those “solutions” come from Sandefer, who one decade ago was a part-time teacher at UT’s McCombs School of Business, where he helped build a well-regarded entrepreneurship program. In 2002, the school began to bring in more full-time, tenure-track faculty. Sandefer and his collaborators left, unhappily, taking their copyrighted curriculum with them. The curriculum that Sandefer et al. took with them grew into the Acton School of Business, an intensive one-year MBA program founded by Sandefer and affiliated with Hardin-Simmons University. Courses do not follow a traditional lecture model and are taught not by researchers, but by practicing business people. The curriculum itself is owned and licensed by the Acton Foundation for Entrepreneurial Excellence. From 2007 through 2010, the president of the AFEE was Rick O’Donnell, who also served as a senior research fellow at the TPPF during that time. He moved to Texas and took the position after a failed 2006 congressional bid in Colorado, where he previously served as executive director of the state’s department of higher education. Among his supporters was Alex Cranberg, an associate of Sandefer’s from the oil and gas industry. Cranberg, a UT alum and son of a noted nuclear physics researcher, recently returned to Austin and was rapidly appointed by Perry to a coveted spot on the UT Board of Regents. When Perry appointed Cranberg, he re-appointed regent Brenda Pejovich (originally appointed in July 2010), who now chairs a task force Gene Powell, the new board of regents chairman, assembled to examine “university excellence and productivity.” Like Sandefer, she is on the TPPF board. In 2008, the conservative group collaborated with Perry to bring together regents from the state’s university systems and encourage them to consider a new approach. This sort of push was actually nothing new for Perry. In 1999, when he was lieutenant governor, he assembled a Special Commission on 21st Century Colleges and Universities to examine “ways to prepare an enhance the higher education.” Sandefer was tapped to be a member. Nearly a decade later, at the 2008 meeting, Perry asked the regents to consider seven “breakthrough solutions” developed by Sandefer. Many of them seek to put more control in the hands of students, while taking some away from the entrenched forces of higher education. One provides in-state students with vouchers funded with the money that is currently funneled directly to public universities. Another calls for the development of a new accrediting agency. Another proposal that particularly rankles academia calls for the splitting of research and teaching budgets, which the foundation says allows for excellence in both but others worry is merely lays the groundwork to choose the latter over the former, particularly because it is less expensive. The Texas A&M System was the first to implement the solutions, giving professors cash bonuses for good student evaluations. In 2010, A&M officials attracted attention for laying out in a document the revenue generation of every professor. It was this step that caught the attention of the AAU, which is widely accepted as the keeper of the Tier One designation. Miller, for one, believes these specific reforms have not worked at A&M, and hurt the case for moving forward on them at UT. Though, he supports Powell's creation of the task forces (there is also a second one on "blended and online learning"), noting that he would question anyone that did not believe that was something the System should be looking into. David Guenthner, a spokesman for the TPPF, said, “Certainly we hope the University of Texas System will move forward with reforms. We think these are important ideas.” But, he also added, that’s entirely in the hands of Powell and his fellow regents.